My average speed 10.8 mph for 44 miles home to South Park to Chinley to home. Awesome! Fabulous sunny day in brilliant cycling weather. 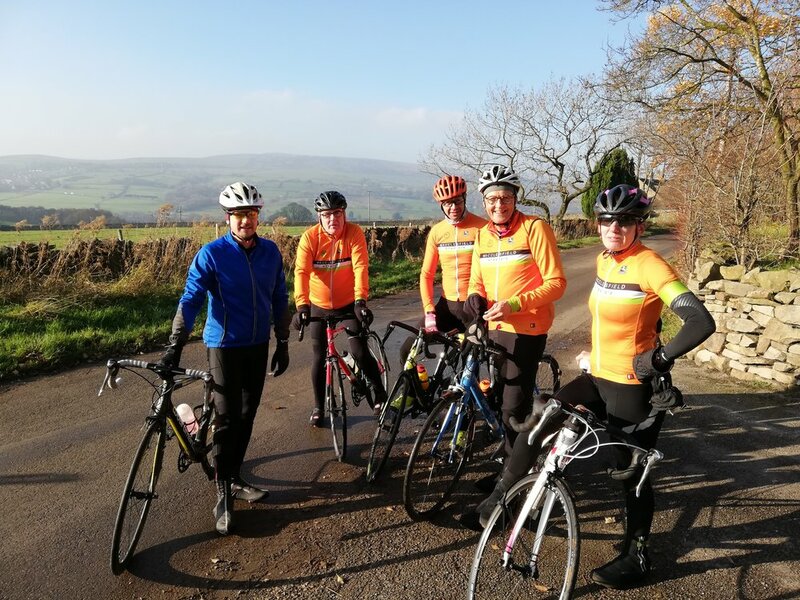 Phil met us in the cafe (Tea on the Green) because the ride leader stupidly forgot to amend the start time on the website from 10.00 am to 9.00 am until Thursday or Friday. For clarity, we’ll carry on starting at 9.00 am until it starts getting frosty, then we’ll switch to 10.00 am for the rest of the winter. Mark caught us on the Brickworks, just after this photo, cropped because you really don't need to see the inside of my phone case, do you? It’s black and doesn’t photograph well. Nervous smiles just before we tackle Chinley Churn (well, three of us do but I am far to discreet to name the names). Top of Long Hill on the return leg: Russell, Chris, Andrew, Vikki (warming up for the Conway Half Marathon tomorrow) and Mark, with Phil in red in the background still giving Long Hill plenty of wellie. Vikki, second up The Street. Ride Leader gasping up The Street. Ride Leader smug that he has overtaken a Mountain Biker on The Street.